Drum Corps International – Marching Music’s Major League™ (DCI) announces its schedule for the 2018 DCI Summer Tour. The world’s most elite marching music ensembles are set to entertain thousands in football stadiums across the United States, beginning with the Tour Premiere this coming Thursday, June 21. DCI's 52-day nationwide tour features 109 captivating shows in 37 states on the road to the DCI 2018 World Championships in Indianapolis, Indiana. Drum Corps International – Marching Music’s Major League™ (DCI) announces its schedule for the 2018 DCI Summer Tour. The world’s most elite marching music ensembles are set to entertain thousands in football stadiums across the United States, beginning with the Tour Premiere on Thursday. Since its founding in 1972, DCI has been furthering its mission to promote and inspire unparalleled excellence in music and performing arts throughout the world. Each year, the organization delivers entertainment and education to hundreds of thousands through live performances and nationally broadcast events while delivering Excellence, Education, and Experience. Last year, the organization continued to set new attendance records at shows across the country, as it has for several years running. More than 418,000 fans attended live summer events in 2017 with 48,000+ at the season-ending DCI World Championships – numbers DCI looks forward to topping again in 2018. This year’s extensive tour schedule includes 109 shows in 37 states where 47 drum corps will vie for this year’s World Championship titles in Open, World and International Class divisions. The tour will return to Florida in July for an action-packed event in Orlando, and the season will have new features including a new regional championship event in St. Louis, Missouri on July 15. The full schedule is available by date and location below and at http://www.dci.org/events. The 52-day nationwide tour will open on Thursday, June 21 at Ford Field in Detroit during a star-studded event that will be broadcast live to nearly 500 movie theaters across the country. Featured groups will include many of the top finishers from the 2017 season. The official tour will then move across the U.S. throughout the summer and culminate for more than 5,600 high school- and college-aged performers at the world’s biggest show in marching music – the DCI World Championships August 6-11 starting in Michigan City, Indiana, and ending in Indianapolis at Lucas Oil Stadium. The week-long series will include exciting competitions, exhibitions, and unique events filling the streets of downtown Indianapolis beginning on Wednesday of DCI World Championships Week. The season will feature events hosted in spectacular top-tier venues such as Ford Field in Detroit, Michigan; Stanford Stadium in Stanford, California; Rose Bowl Stadium in Pasadena, California; Camping World Stadium in Orlando, Florida (formerly the Citrus Bowl); TCF Bank Stadium in Minneapolis, Minnesota; The Dome at America’s Center in St. Louis, Missouri; The Alamodome in San Antonio, Texas; Sports Authority Field at Mile High in Denver, Colorado; Mercedes-Benz Stadium in Atlanta, Georgia; BB&T Field at Wake Forest University in Winston-Salem, North Carolina; and New Era Field in Buffalo, New York. Regional championships will be marked by the events in St. Louis, San Antonio, Atlanta, and Allentown, Pennsylvania. 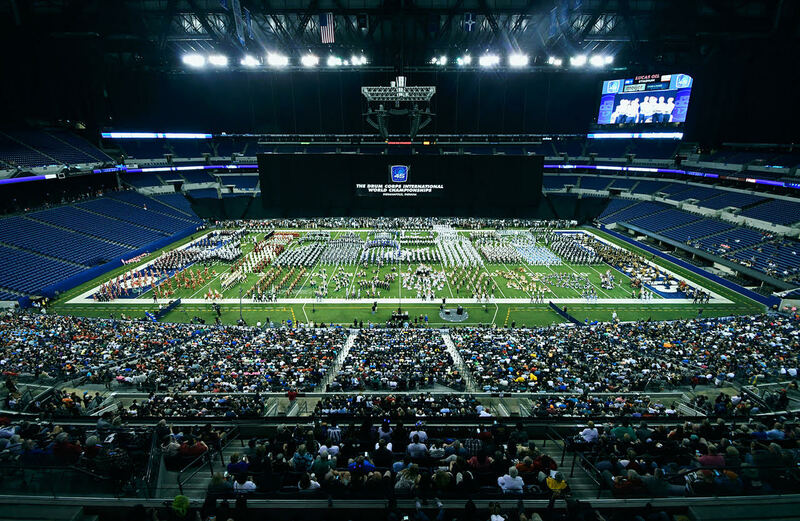 These expanded competitions help to determine the overall seeding and standings for competing groups going into the DCI World Championship Finals in Indianapolis. In addition to the traditional competitive tour, DCI activities will also feature two wildly popular programs that have been sweeping the globe. Now in their fifth year, the innovative SoundSport® and DrumLine Battle™ programs continue to provide more musicians in more venues in more countries with the opportunity to participate in sanctioned performance events to showcase their talents. With an action-packed year on the international scene with events taking place in Ireland, England, Indonesia, Japan, Germany, and all over the United States, both programs will add even more excitement to the fast and furious traditional DCI competitions of the 2018 summer season. During DCI World Championships Week, the 3rd Annual SoundSport® International Music & Food Festival will feature more than 35 ensembles from the U.S. and Canada and from as far away as the United Kingdom and Colombia to compete in downtown Indianapolis the morning and afternoon of Saturday, August 11. The 2018 DCI Summer Tour promises to deliver more electrifying performances than ever! Thursday, June 21 – Detroit, MI – DCI Tour Premiere presented by DeMoulin Bros. and Co.
Sunday, July 15 – St. Louis, MO – DCI Midwestern Championship presented by DeMoulin Bros. and Co.
Saturday, July 21 – San Antonio, TX – DCI Southwestern Championship presented by Fred J. Miller, Inc.
Tuesday, July 31 – Farmington, MN – March On! Subject to change. Full show details, lineups, and tickets are available at http://www.dci.org/events. 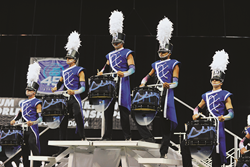 Drum Corps International is the world leader in producing and sanctioning competitive events for the world's most elite and exclusive touring marching music ensembles for student musicians and performers. For additional organization and program information, visit http://www.dci.org.